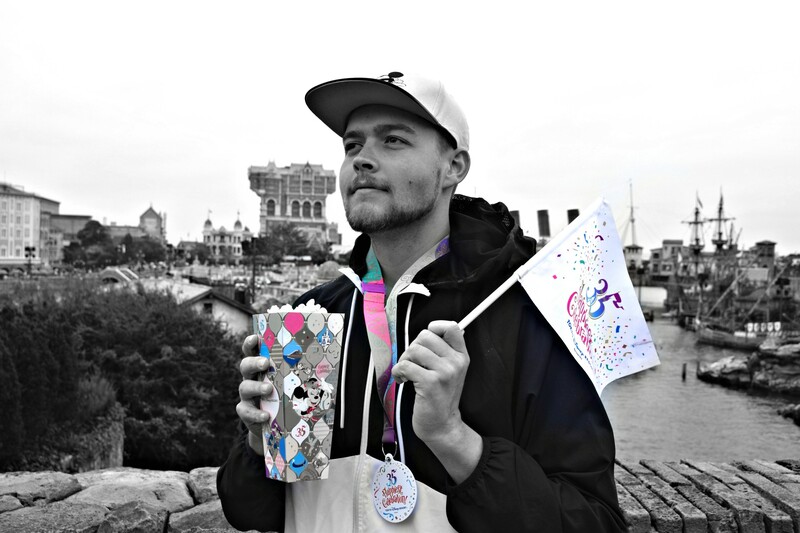 Sean: After spending nearly 3 weeks in Asia to visit 20+ theme parks, we’re back home in Los Angeles. While catching up with work and preparing posts for all those Asian theme parks we’re launching this new Six Flags Magic Mountain Update! 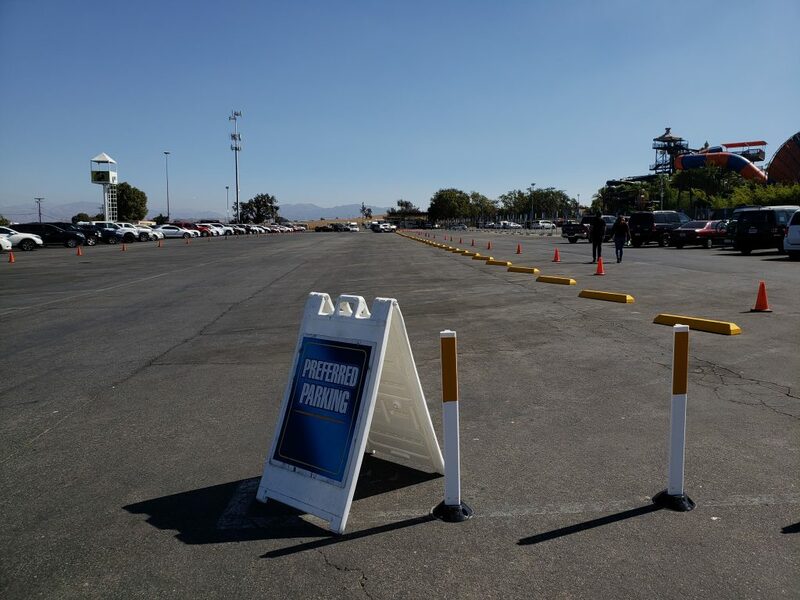 Upon arrival I noticed that with use of small poles and concrete blocks the preferred parking section for Diamond Elite members finally became a bit more of a separate lot than just having traffic cones surrounding the reserved parking spots. Here’s a closer look at the blocks marking the outside of the preferred parking lot. 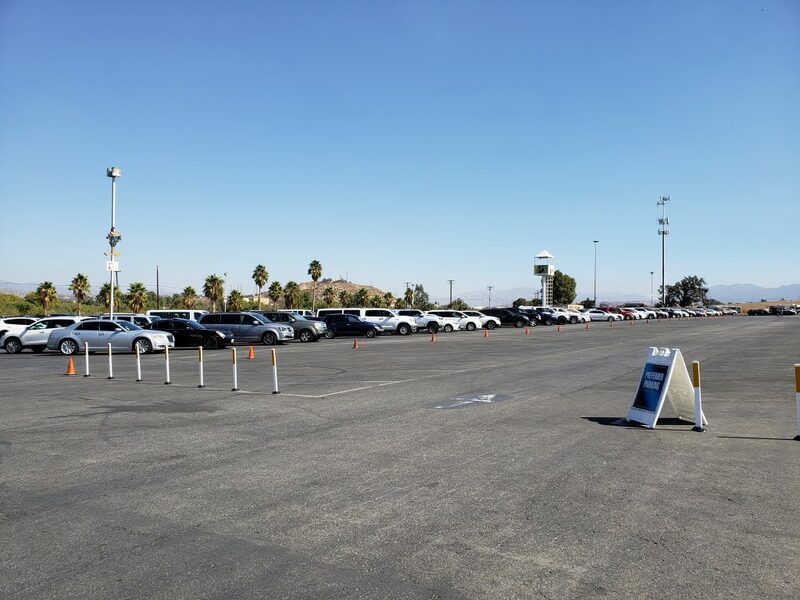 I’m a Diamond Elite member myself but since you have to reserve the spots by 5am the morning of visiting, I have yet to actually reserve a spot. My visits are usually sporadic. I was hoping Viper would have returned by the time I came back from Asia, but unfortunately that’s not the case. 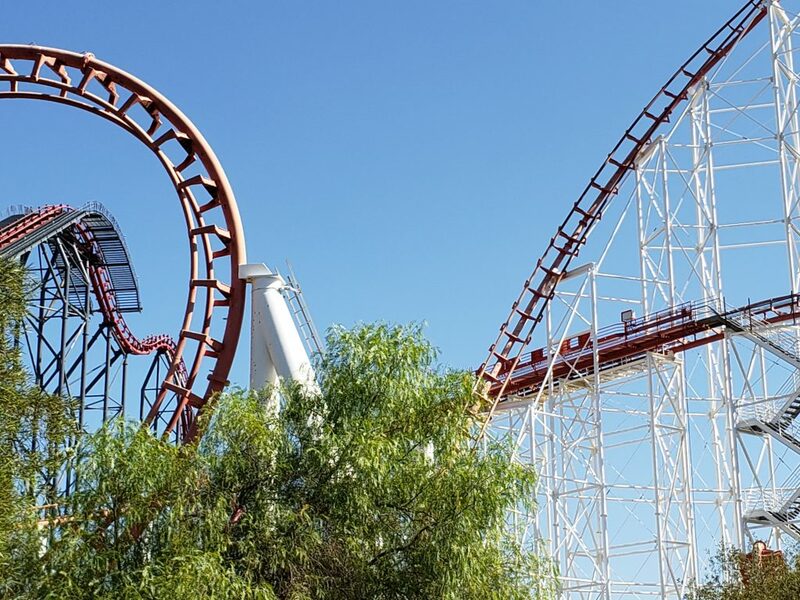 The good news is that the current refurbishment seems to make many positive changes that will extend the lifetime of my favorite classic looper. More on that later. We rode the infamous Eejanaika at Fuji-Q-Highland a few days ago and I was very excited to compare it to X2 again. 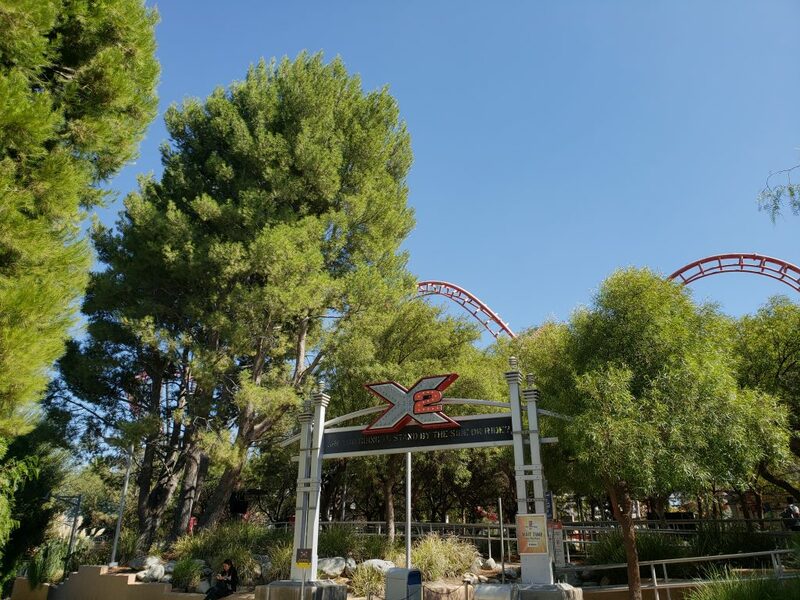 With the usual minimal weekday crowds I was able to marathon X2 for a bit and really got a nice appreciation for what it does as the prototype. I prefer Eejanaika for many reasons but still love X2. 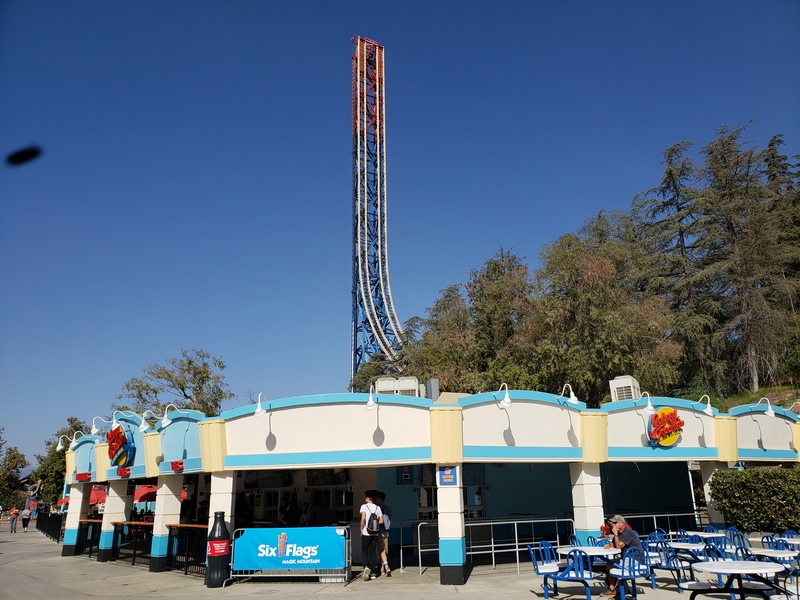 Kudos to Six Flags Magic Mountain for running it so consistently! 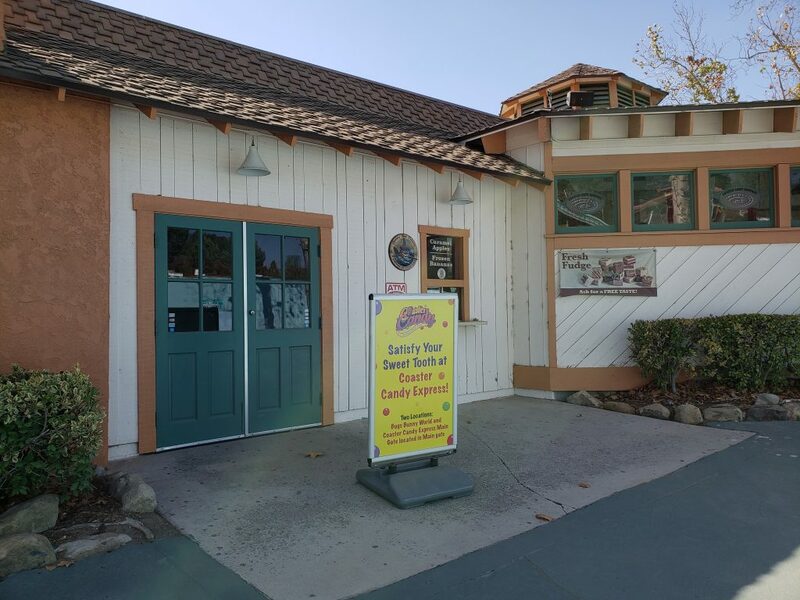 For those looking to ride soon, I have heard that the ride will undergo a lengthy refurbishment in the near future, so get your rides in! To my surprise the fire effects were working on all the rides I took on it. Unfortunately I can’t remember the last time I rode it with the on-board audio working. Given the ride went from X to X2 almost 11 years ago, I wouldn’t be opposed to X3 making an appearance in the future. The ride could use a few upgrades. Below the pink X transfer track, which currently stores one of the X2 trains, I noticed the Apocalypse trains being stored. It may be a bit hard to see but the train(s), split up in individual cars, is dismantled below the X2 storage tracks. 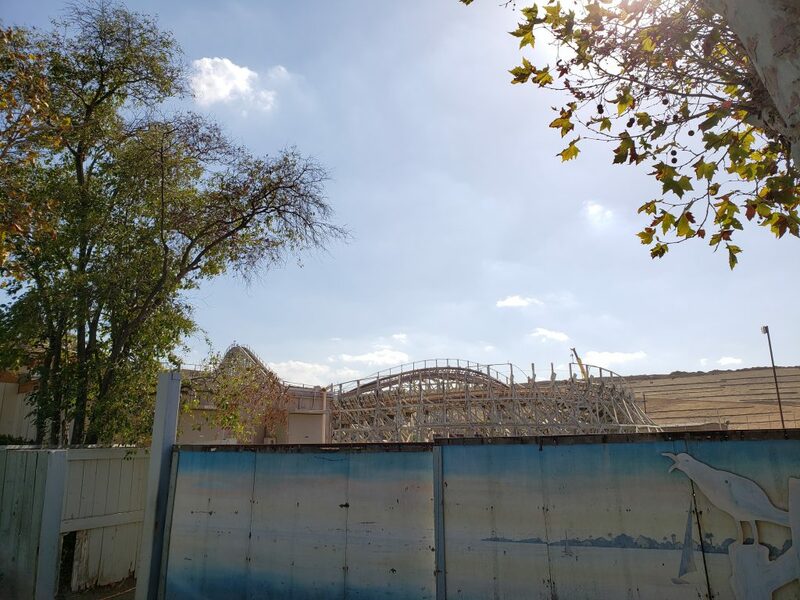 Apocalypse is confirmed to not get a retheme or new name as the park finds its theme appropriate with the upcoming West Coast Racers, an Urban Los Angeles street racing inspired quadruple launch coaster. We’ll say goodbye to X2 for now and move on to the exciting changes happening to its older Arrow brother next door: Viper! 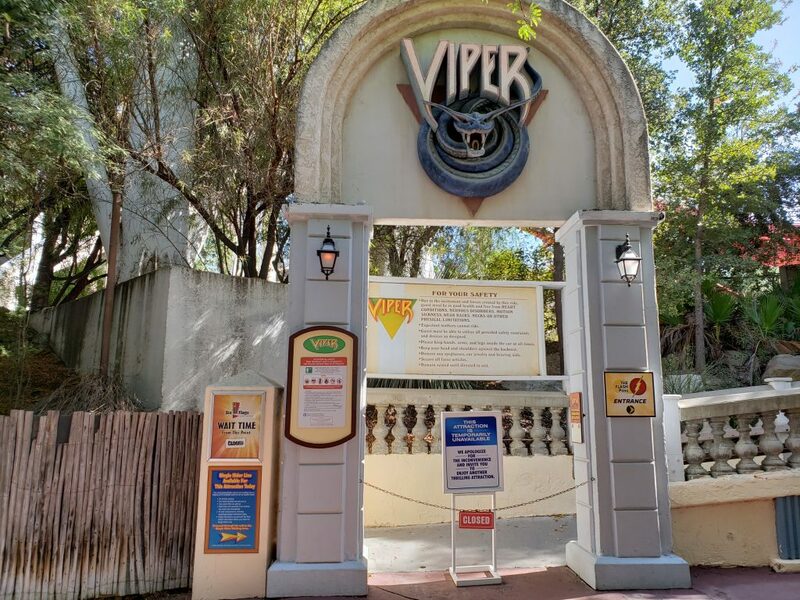 Viper remains closed with 3 of its 4 trains on the transfer tracks. 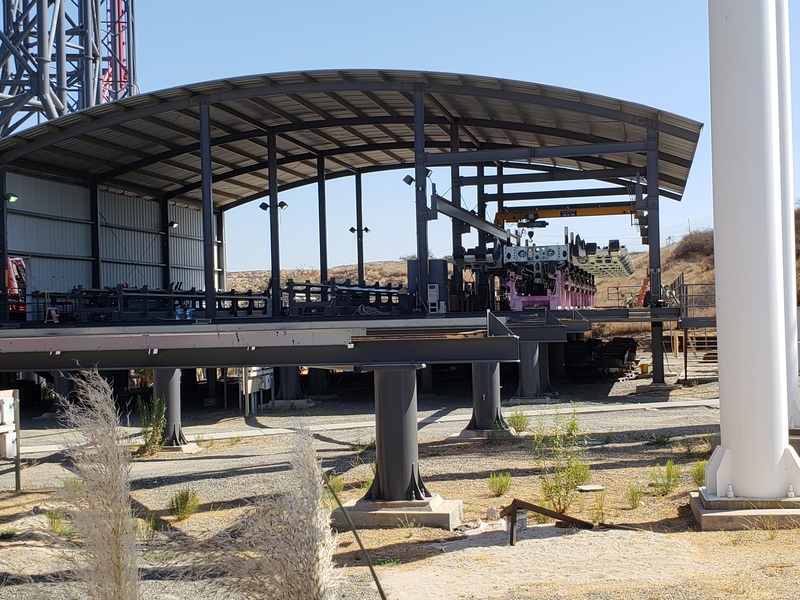 The 1990 Arrow looping coaster is undergoing a refurbishment that is much more serious than I imagined it being. It seems like the operating system and controls are being replaced. 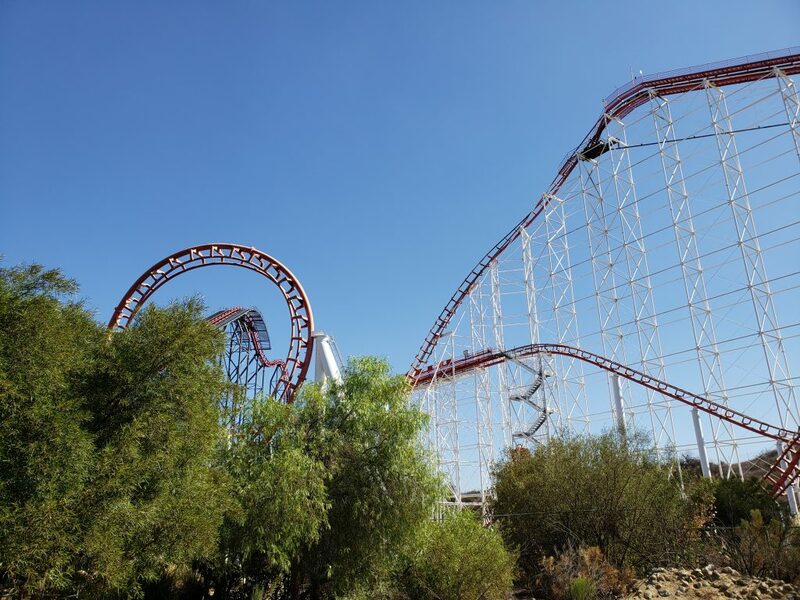 This is great news for those that feared the departure of this great coaster! Brakes along with panels next to the brakes are being replaced. 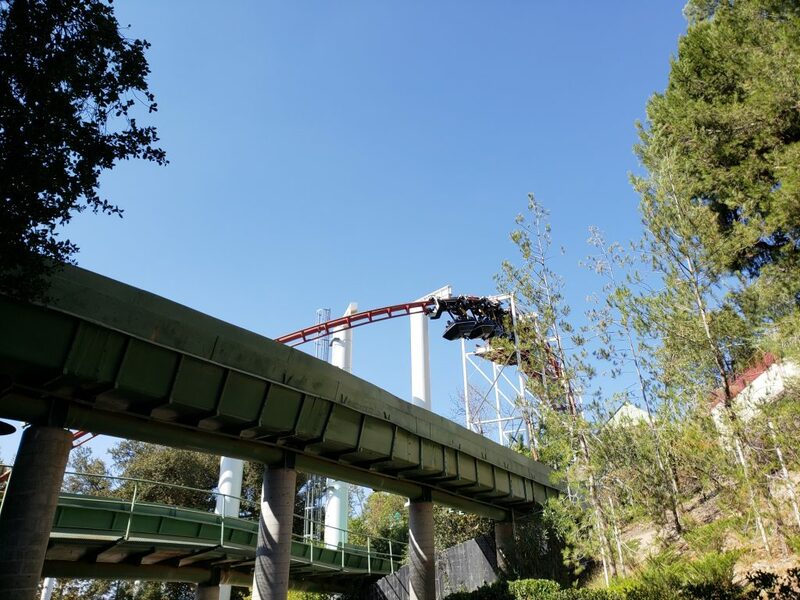 This is the case for the final brake runs, as well as the mid-course brake run. As I was walking by maintenance was busy working on the ride. 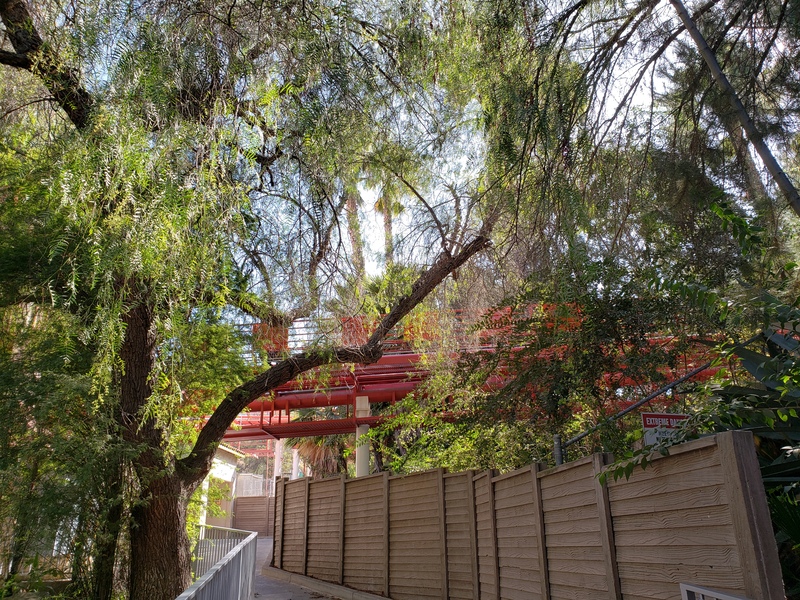 It’s a little hard to see as I was unable to access the ride’s queue or exit, but new handrails with more panels have been installed on the ride with a new dark orange color. 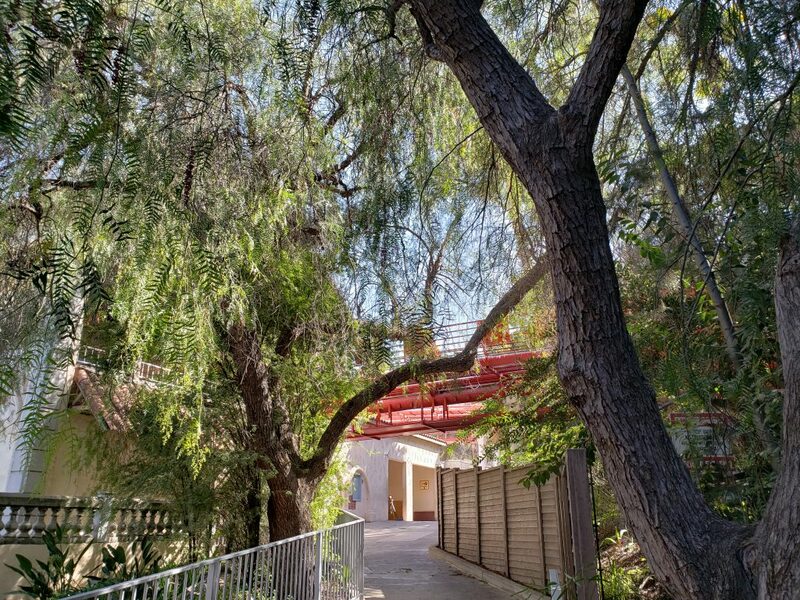 This color is quite obvious compared to the faded catwalks, track and handrails surrounding the new ones. The new paneling and handrails are a bit more noticeable on the mid-course brake run of Viper. If you have a hard time seeing it, I had a terribly hard time photographing it. If you look closely the difference in colors and handrail size will be noticeable. Hopefully my favorite looper opens up again soon, we have lots of plans ahead and I need some Viper in my life. 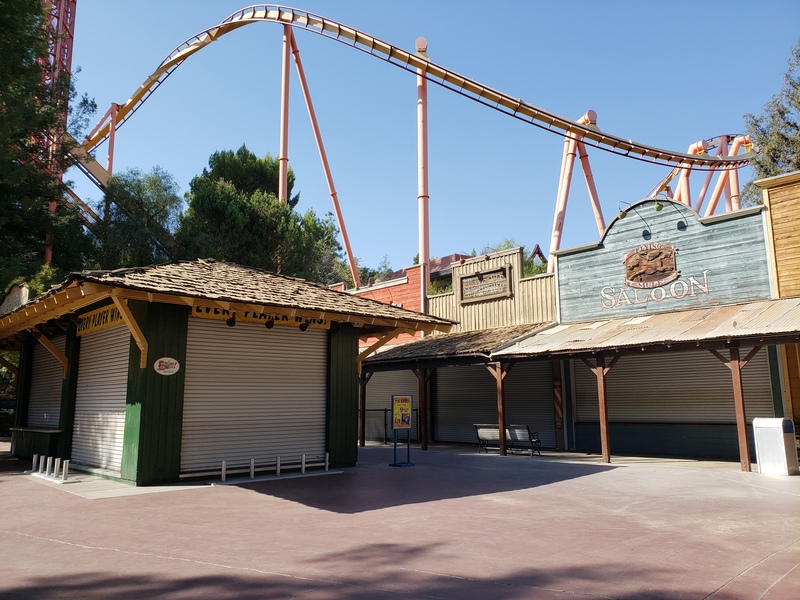 One thing that was obvious with daily operations was the lack of open food stands and the major games being closed next to Tatsu. 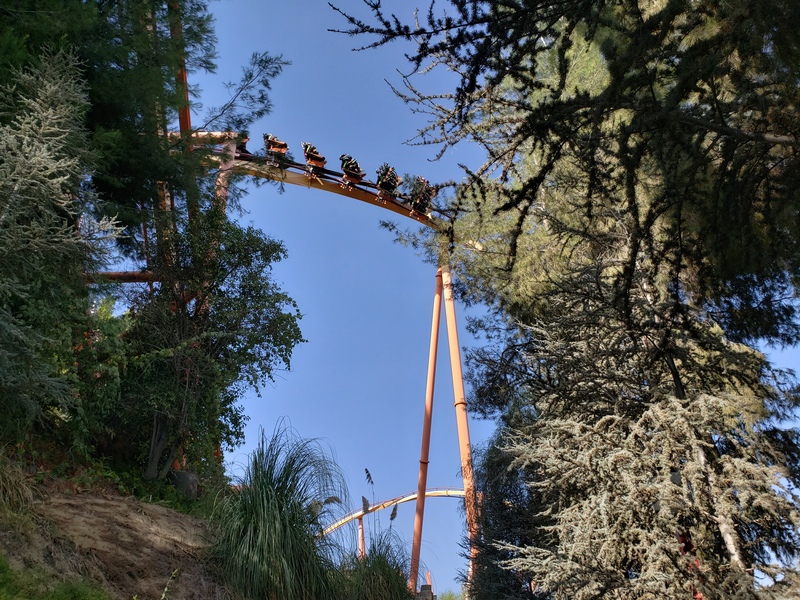 It wasn’t particularly crowded but definitely still 1-2 train waits on most coasters, there were people all over the park. 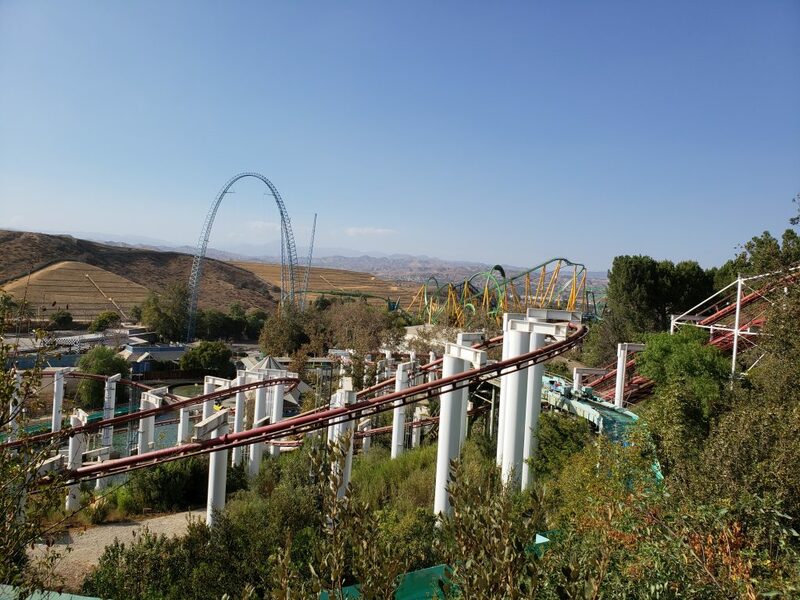 Having said that, we can’t complain as Six Flags Magic Mountain’s weekend operations are great. 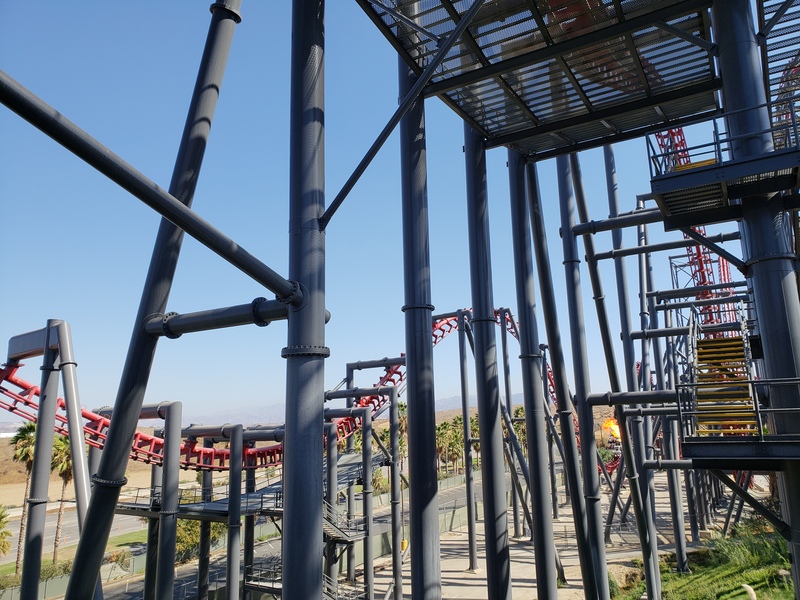 No Six Flags Magic Mountain visit is complete without the black belt of steel coasters: Ninja! 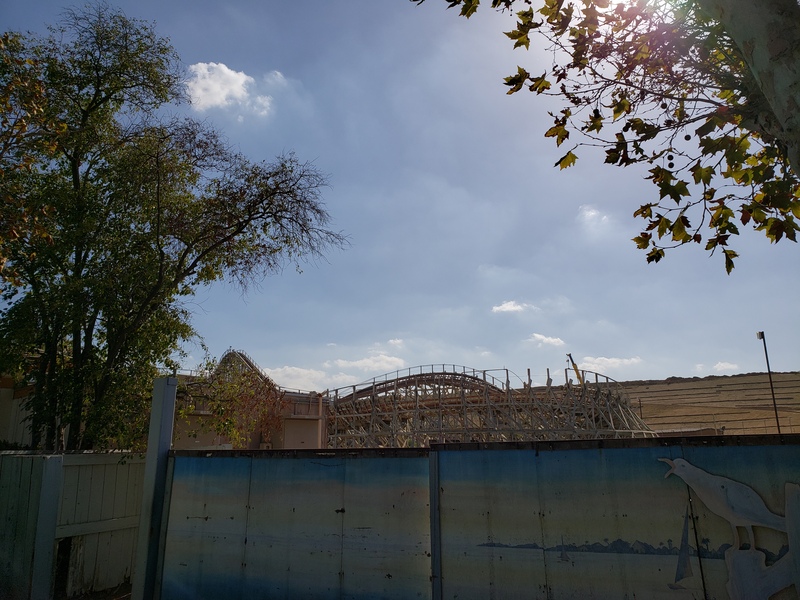 Let’s head down to the 2019 construction area, still known as Cyclone Bay. With everything closed, you may wonder why they haven’t closed it yet. That’s because there is a Fright Fest maze down next to Apocalypse. 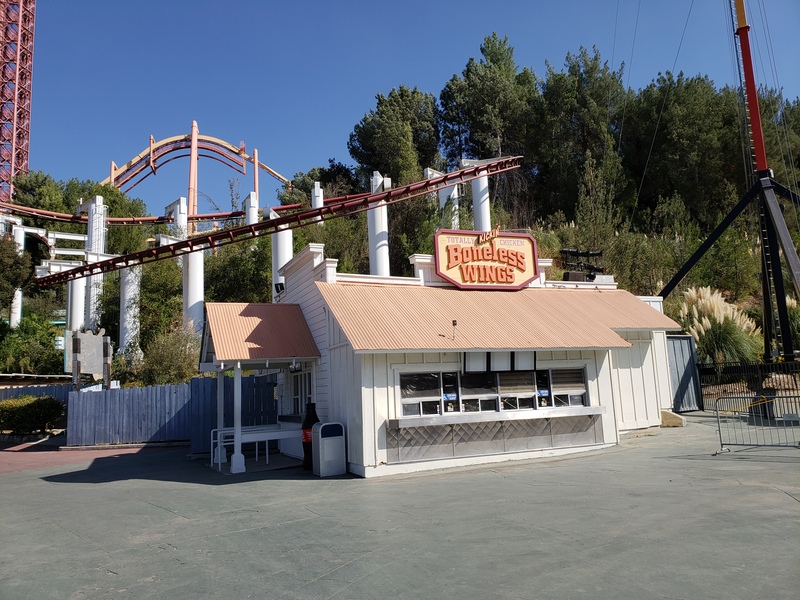 The Totally Kickin’ Chicken restaurant is undergoing a refurbishment currently in anticipation of the newest coaster. I haven’t seen terribly much activity around Apocalypse in months. 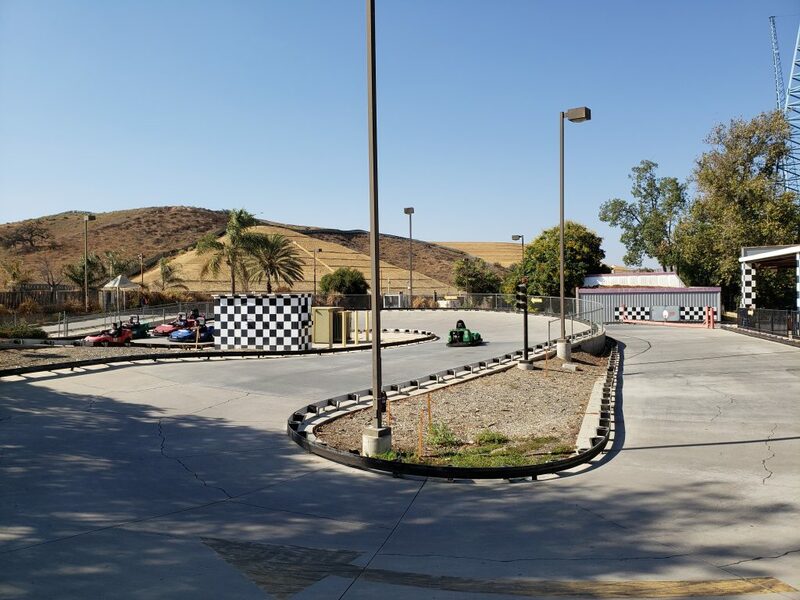 The final turn around remains left without track. 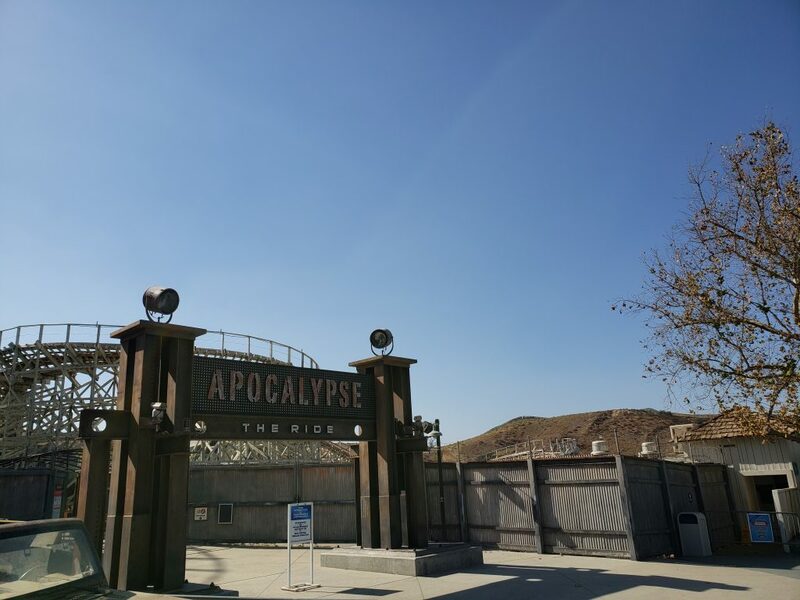 As mentioned above, the park has confirmed that there will not be a retheme for Apocalypse. Though this Coaster Candy Company location is still used for actual candy making, the sign in front of the store directs people to the newly launched Coaster Candy Company that is located next to the Full Throttle Sports Bar. Here’s a closer look at the Apocalypse retracking. Not much has changed in recent weeks. 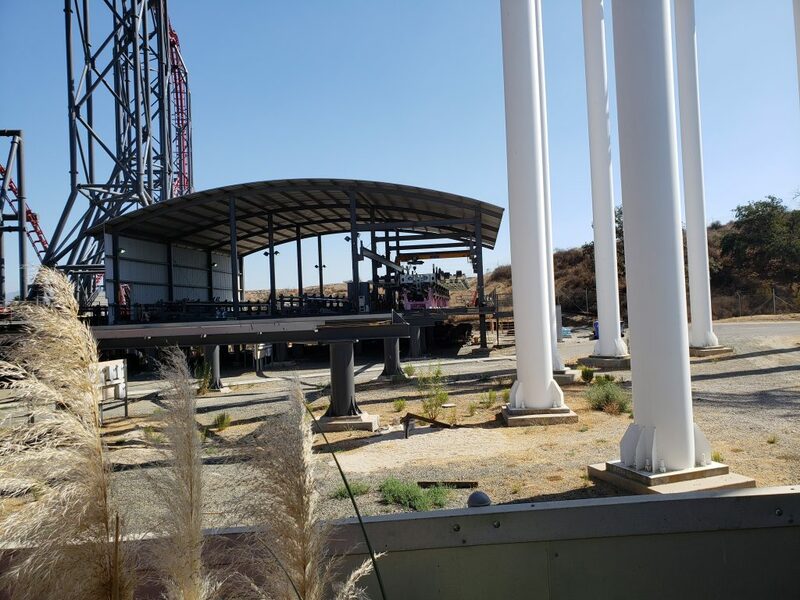 When it comes to construction of West Coast Racers, as of right now it is still just footers and no track has arrived yet. 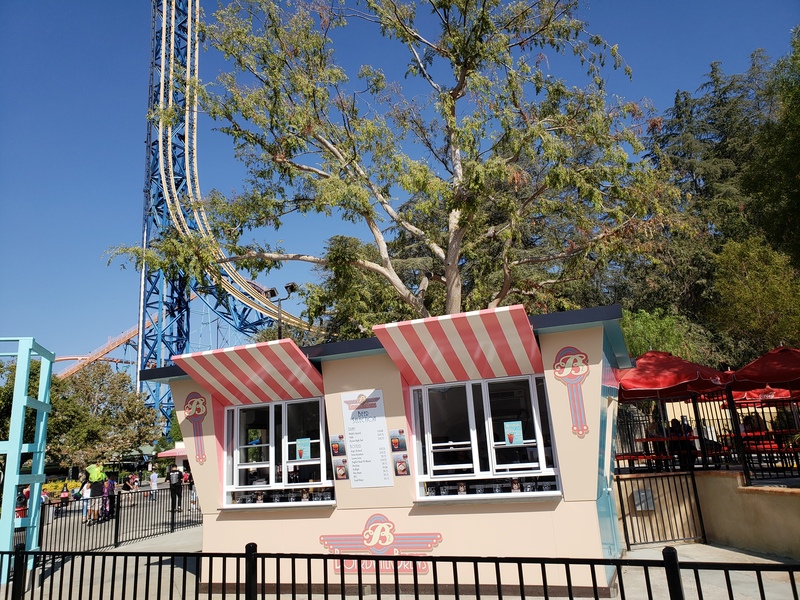 Rides in the area that will be affected by overhead construction such as Cyclone 500 and Daredevil Dive remain open at this time. 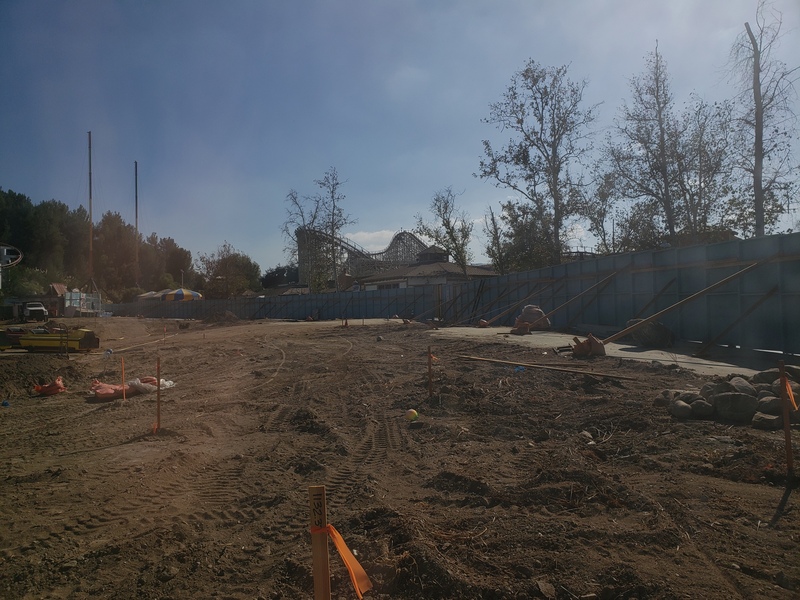 The West Coast Racers construction plot has remained virtually unchanged as well since our last update. 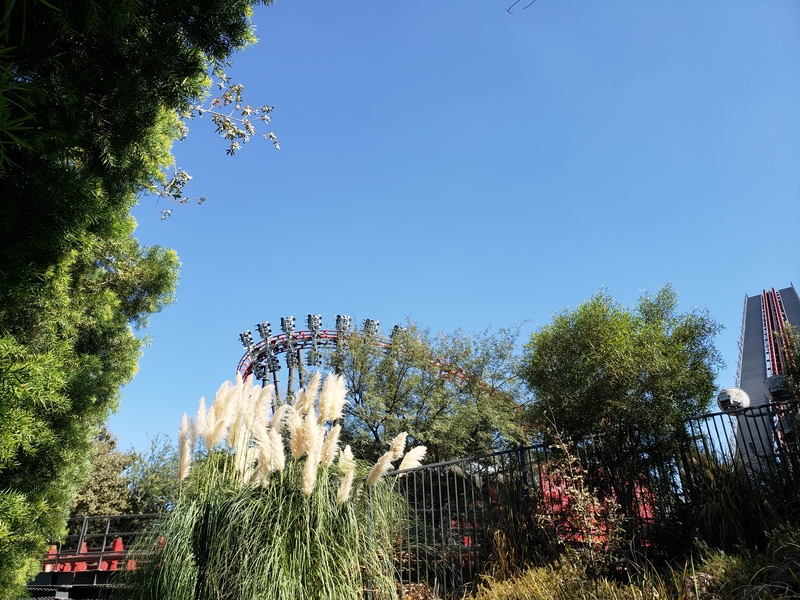 It is safe to assume the park has focused its efforts on Fright Fest, which has much improved this year! 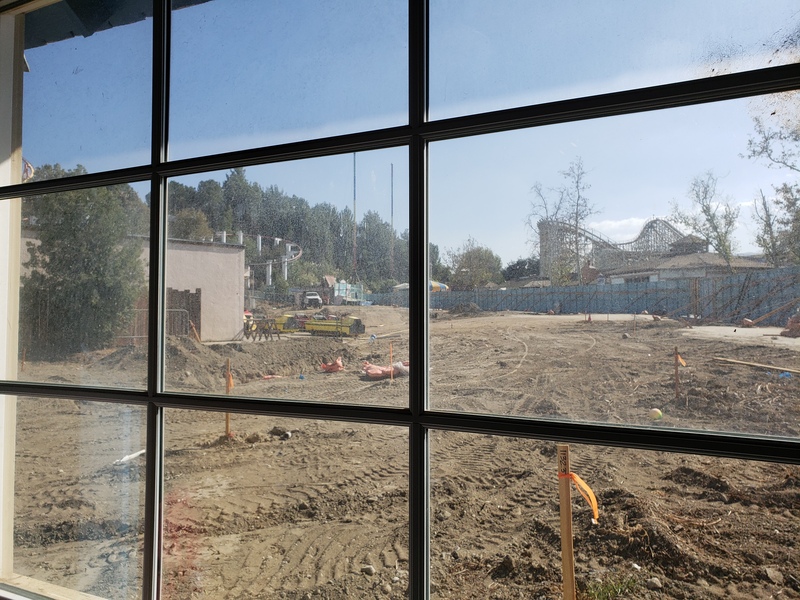 If you ever want a personal look at the construction zone, the Xtreme Zone gift store looks right over the construction site! 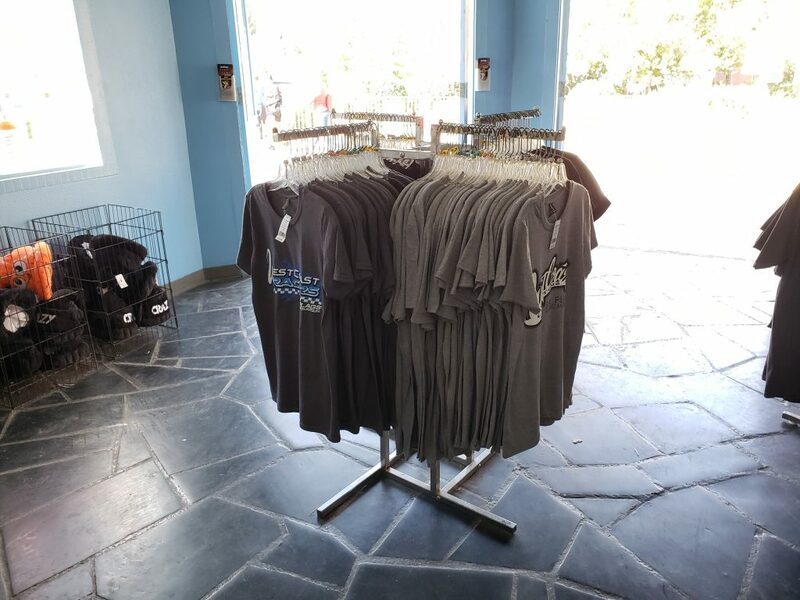 The store already sells West Coast Customs and West Coast Racers shirts! 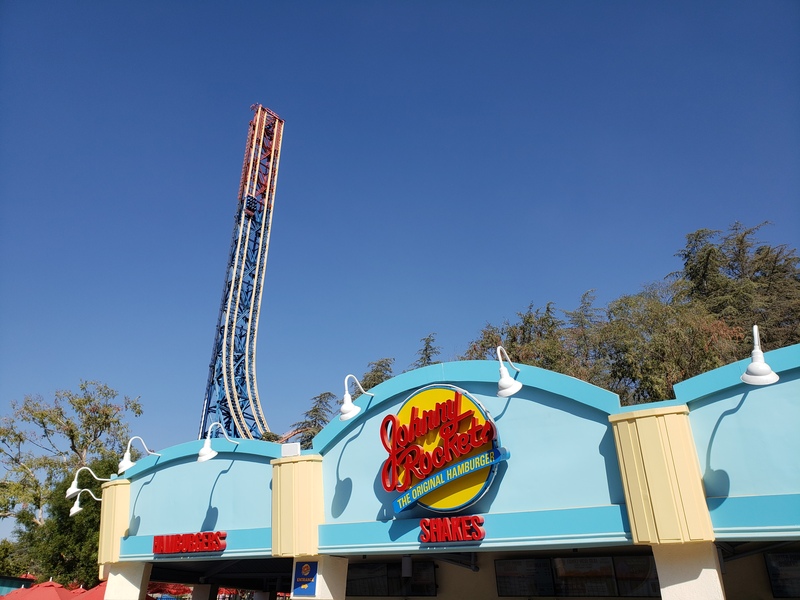 Now onto the Boardwalk where CraZanaity and Jammin’ Bumpers opened this year. The final product seems to finally be complete with the refurbished Johnny Rockets having reopened. 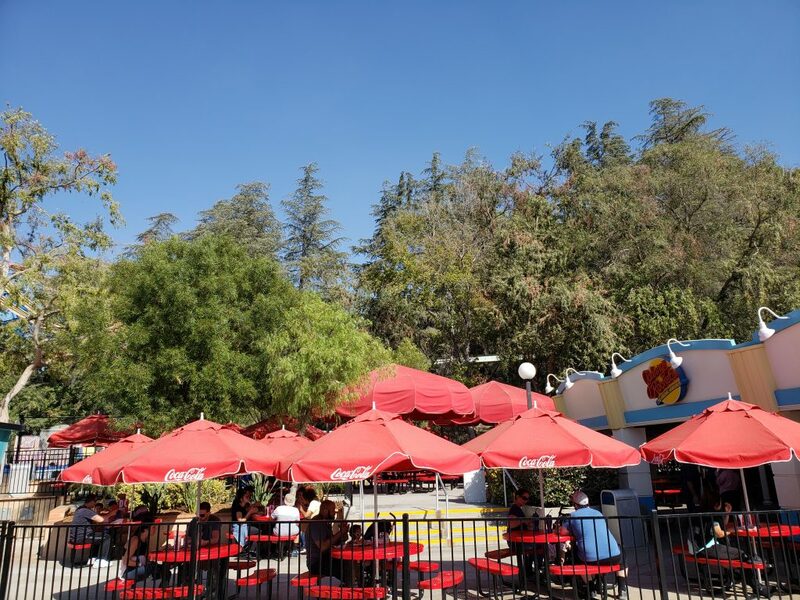 Johnny Rockets now utilized its queue, designated order and pickup windows as well as its new dining terrace. 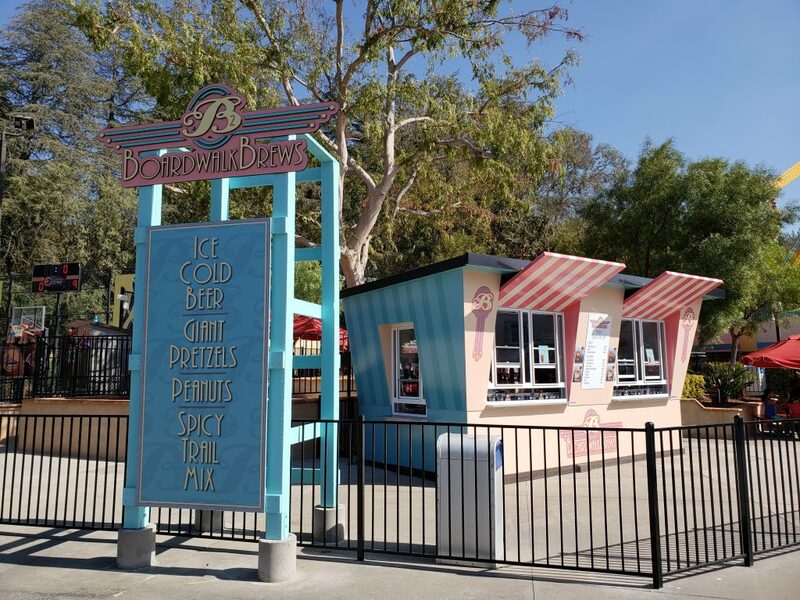 The new dining terrace is shared with the new Boardwalk Brews that just opened and has several areas of fenced off dining space with landscaping and shade. It looks quite nice. 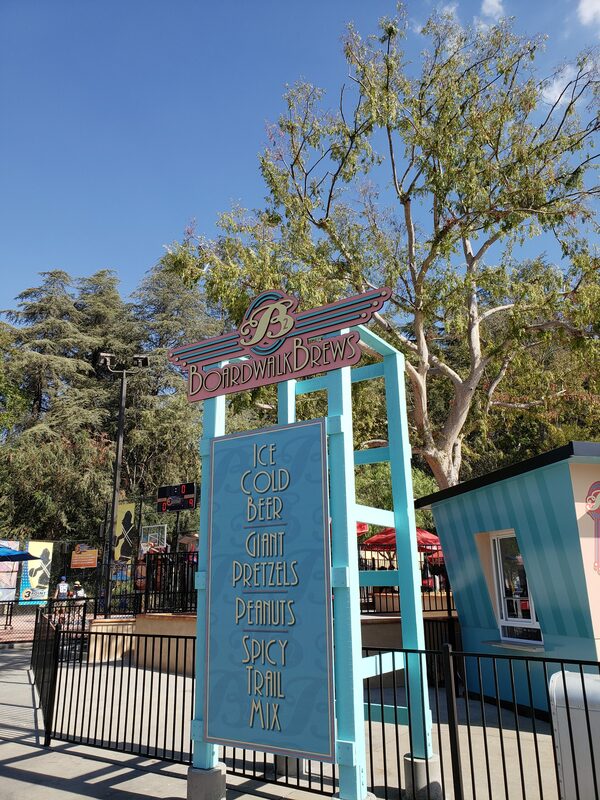 Ice cold beer, giant pretzels, peanuts and spicy trail mix. The colors they went with perfectly compliment the Boardwalk and I’m very impressed with how this looks. 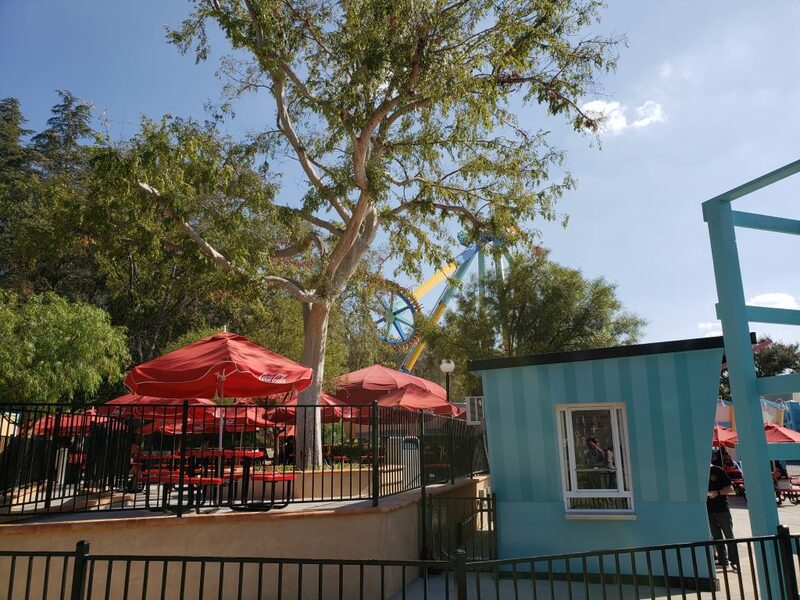 Especially since the park has made no mention of it appearing. Great little addition. 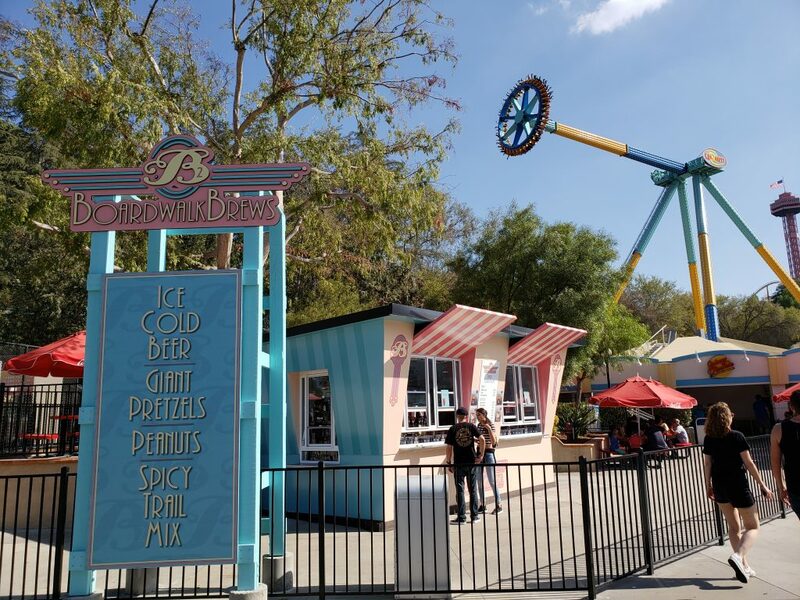 Make sure to stop by on your next visits and enjoy a beer while admiring the 170+ feet tall CraZanity! For those concerned about space to dine, there are tables all around the buildings at multiple levels! Next up! Scream! The ride has a bit of a rattling issue, though I still enjoyed my ride. 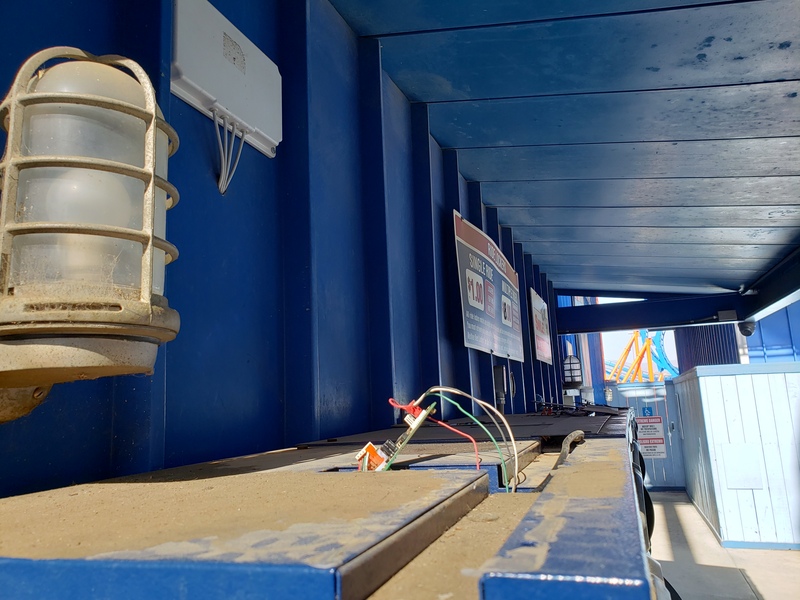 The lockers and their plainly exposed cable work was a bit more concerning, it was easy to touch and I think the park may wants to look into covering this up. Both sets of lockers had this exposed and were operational. 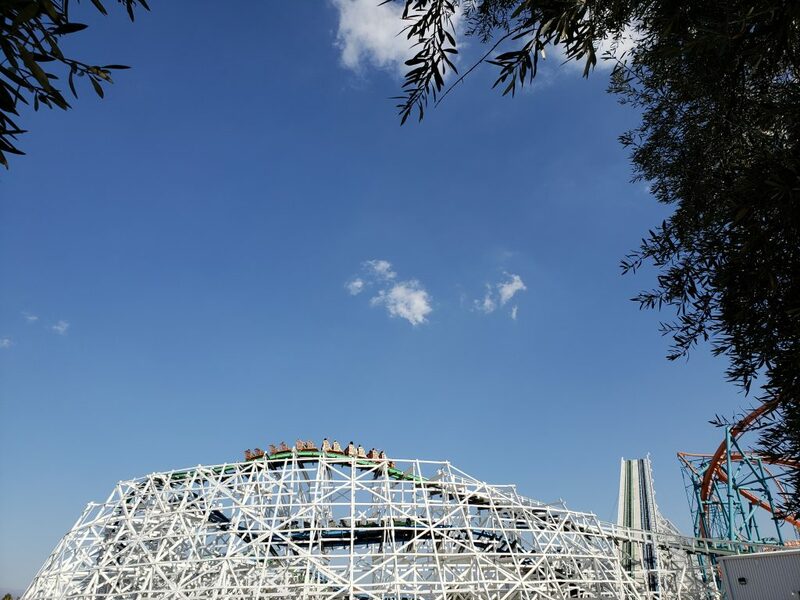 Was luckily enough to witness Twisted Colossus racing a lot today! I guess low crowds really help. 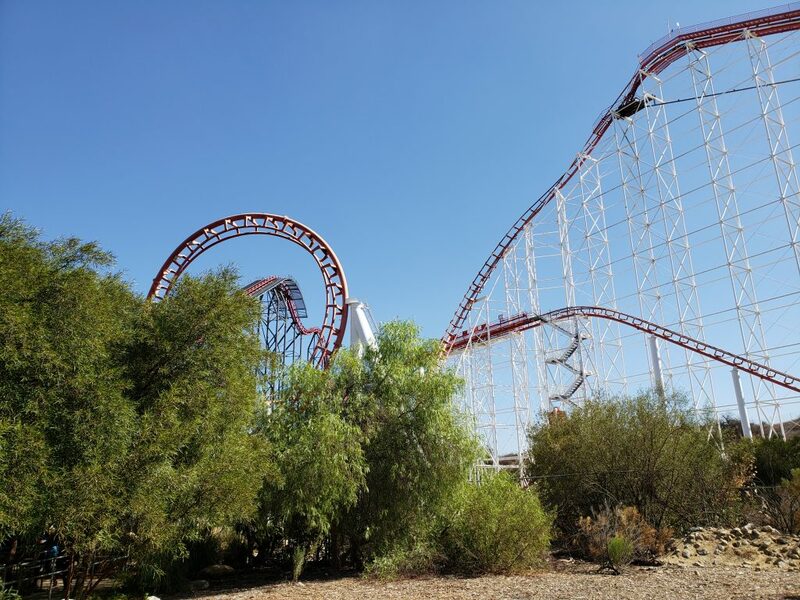 Thank you Six Flags for operating Twisted Colossus with three trains while almost all rides were down to one train! 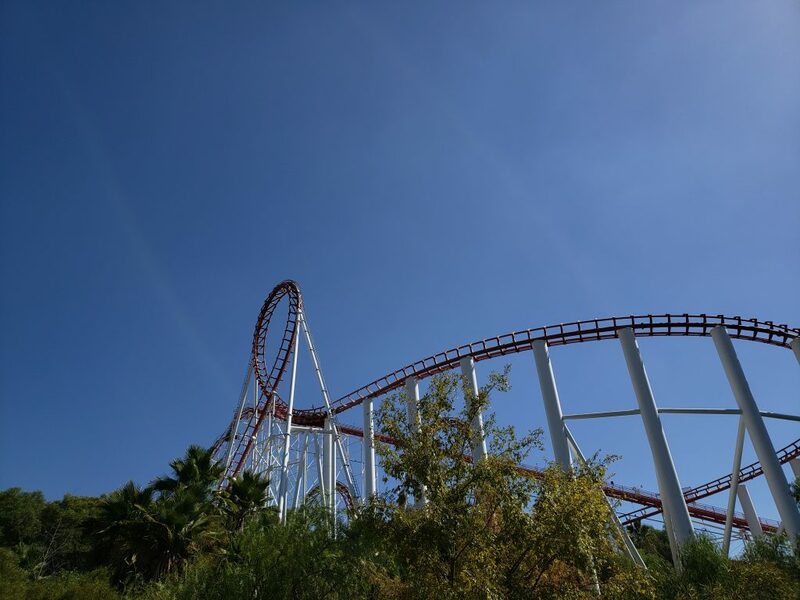 Overall I had a great time at the park and am starting to appreciate these daily operations more and more. It was great to relax for a bit and ride my favorites. With this picture of Tatsu I will wrap up the report. We rode Flying Dinosaur at Universal Studios Japan a few days ago, which quickly became my favorite Flying Coaster. 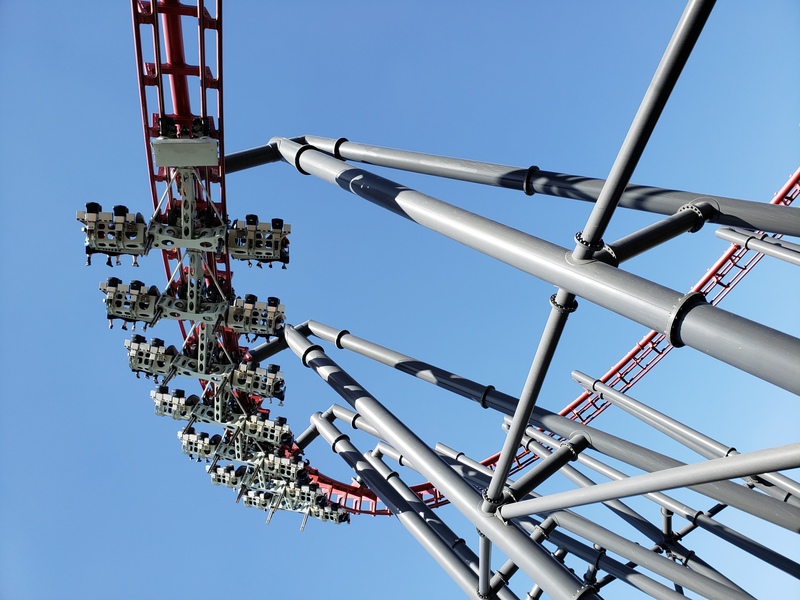 Stay tuned for reports of major parks like USJ, Tokyo Disneyland and Tokyo DisneySea, Hong Kong Disney, Ocean Park Hong Kong, Fuji-Q Highland, Nagashima Spa Land and more, soon! 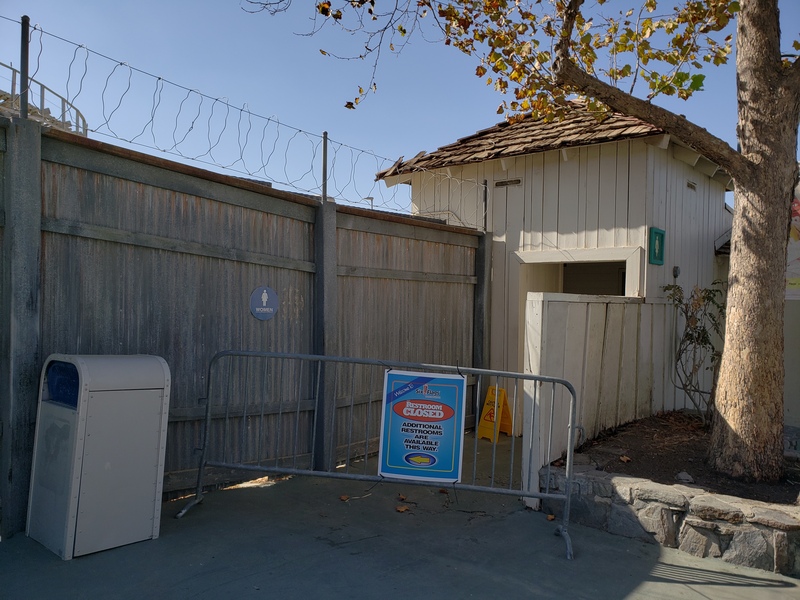 Next PostNext Tidal Twister – New for SeaWorld San Diego in 2019!